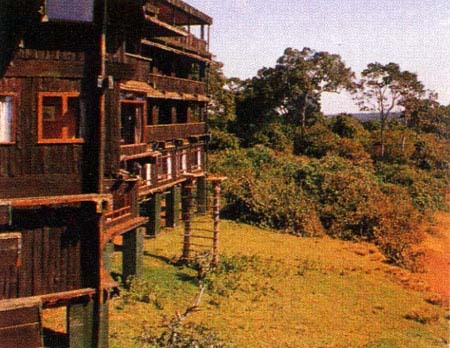 The only ‘tree hotel’ ever to be built on the slopes of Kenya’s legendary Mount Kenya, Serena Mountain Lodge offers a matchless game viewing opportunity whilst combining a glorious panorama of mountain vistas with the primordial splendours of an ancient rainforest. 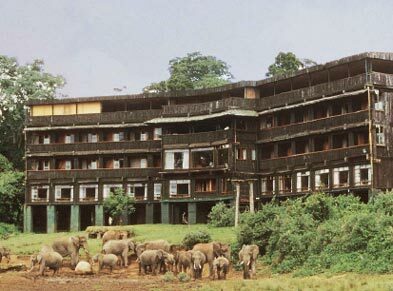 Floating 2,195 m high on the flanks of Kenya’s highest mountain and secreted deep within her largest forest reserve, the lodge offers not only the champagne-clarity of mountain air, the tranquility of the forest and a colourful cavalcade of wildlife but also the chance of scaling the icy peaks of Africa’s second-highest mountain. Guests can also awake to the trumpeting of elephant, fall asleep to the symphony of the African night or sit in stillness and observe the fascinating interplay of the animals as they arrive to drink, bathe, spar and forage around the water hole. Finally, they can venture down to the secret viewing hide by the water’s edge and experience the awesome thrill of being only meters away from some of the most massive beasts on earth. Sailing like an ark above the rainforest’s waxy-green canopy, the first sight of Mountain Lodge sets the scene for the experience to come and provides a dramatic climax to the tantalizing approach up the lower slopes. A timbered drawbridge leads from a winding path in the depths of the rainforest, over a moat of sun-dappled jungle and up on to the wooden ‘decks’ of the forest-green, timbered lodge. Inside, the impression of having boarded a ship is perpetuated by a combination of log panelled walls, timbered game-viewing decks and winding stairs leading to a selection of snugly comfortable, cabin-styled rooms. Cool, tranquil and hushed for optimum game-sightings, the open-air viewing-deck looks down onto the endlessly shifting scenes of the wildlife theatre that troops and teems around the salt lick and waterhole below. Come evening, the softly glowing lamps and warmly upholstered arm-chairs allow for optimum night-viewing whilst for those in search of a really close wildlife encounter, a special ‘hide’ has been built at the water hole’s edge delivering once-in-a-lifetime closeness to some of the world’s rarest animals. Inside, the cosily-welcoming bar centres on a glowing fire and has been tastefully decorated with traditional Kikuyu handicrafts and a series of sepia prints depicting the traditional Kikuyu way of life. 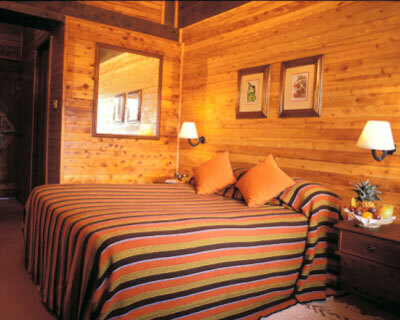 The brightly renovated rooms, meanwhile, feature thick-pile locally woven rugs and wall-hangings, whilst the décor has been designed to provide glowing warmth and fireside comfort against the evening chill of this unique tropical mountain environment. - Express check-in and check-out facilities.